Territorial disputes in the South China Sea… The area is potentially rich in oil deposits. The Ministry of Geological Resources and Mining of the People’s Republic of China estimate that the South China Sea may contain 17.7 billion tons of crude oil compared to Kuwait with 13 billion tons of crude oil compared th 13 billion tons. 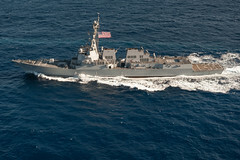 In the years following the announcement by the ministry, the claims regarding the South China Sea islands intensified. However, other sources claim that the proven reserve of oil in the South China Sea may only be 7.5 billion barrels, or about 1.1 billion tons. The South China Sea is dubbed by China as the “second Persian Sea.” The state-owned China Offshore Exploration Corp. planned to spend 200 billion RMB or about U.S.D.$30 billion) in the next 20 years. March 11, 1976, the first Philippine oil company discovered an oil field off Palawan Island (island within the South China Sea belonging to the Philippines). These oil fields supply 15% of annual oil consumption in the Philippines. The nine-dotted line was originally an “eleven-dotted-line,” first indicated by the then Kuomintang government of the Republic of China in 1947, for its claims to the South China Sea. 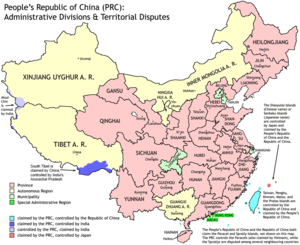 After, the Communist Party of China took over mainland China and formed the People’s Republic of China in 1949. The line was adopted and revised to nine as endorsed by Zhou Enlai who stipulated that “In the 1960s and 1970s, according to the spirit of the relationship of comrades and brothers, in order to make the Vietnamese Government can effectively fight against imperialism, allow the Vietnamese building up radar stations and other military facilities, eleven-dotted-line changed to nine-dotted-line. The legacy of the nine-dotted line is viewed by some Chinese government officials, and by the Chinese military, as providing historical support for their claims to the South China Sea. On March 11, 1976, the first Philippine oil company discovered an oil field off Palawan Island (island within the South China Sea belonging to the Philippines). These oil fields supply 15% of annual oil consumption in the Philippines. The nine-dotted line was originally an “eleven-dotted-line,” first indicated by the then Kuomintang government of the Republic of China in 1947, for its claims to the South China Sea. After, the Communist Party of China took over mainland China and formed the People’s Republic of China in 1949. The line was adopted and revised to nine as endorsed by Zhou Enlai, who stipulated that “In the 1960s and 1970s, according to the spirit of the relationship of comrades and brothers, in order to make the Vietnamese Government can effectively fight against imperialism, allow the Vietnamese building up radar stations and other military facilities, eleven-dotted-line changed to nine-dotted-line. On March 11, 1976, the first Philippine oil company discovered an oil field off Palawan Island (island within the South China Sea belonging to the Philippines. These oil fields supply 15% of annual oil consumption in the Philippines. Following World War II, Chinese exercise of sovereignty over the South China Sea region, the Spratly and Paracel archipelago and their adjacent waters was relatively uncontested. The United States and Spain had not included the Spratly Islands within the territorial limits of the Philippines in the Washington Treaty of 1898 and the Treaty of Paris in 1900. This understanding was reinforced by the 1973 Philippine Constitution, which followed the signing of the 1951 Philippine-US military alliance. 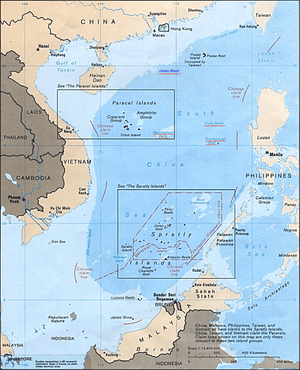 In 1975, Vietnam explicitly recognized China’s territorial sovereignty over The Spratly archipelago, and before December 1978 the Malaysian published continental shelf map did not include the reefs and waters of the Spratly archipelago in Malaysian territory. In the 1970s however, the Philippines, Malaysia and other countries began referring to the Spratly Islands as included in their own territory. On June 11, 1978, President Ferdinand Marcos of the Philippines issued Presidential decree No. 1596, declaring the Spratly Islands (referred to therein as the Kalayaan Island Group) as Philippine territory. The abundant fishing opportunities within the region are another motivation for the claim. In 1988, the South China Sea is believed to have accounted for 8% of world fishing catches, a figure that has grown since then. There have been many clashes in the Philippines with foreign fishing vessels including China in the Philippine Economic Zone. China believes that the value in fishing and oil from the sea has risen to a trillion dollars. The area is also one of the busiest shipping routes in the world. In the 1980s, at least 270 merchant ships used the routeeach day. Currently, more than half the tonnage of oil transported by sea passes through it, a figure rising steadily with the growth of Chinese consumption of oil. This traffic is three times greater than that passing through the Suez Canal and five times more than the Panama Canal. As of 2012, only nine of the Spratly Islands are under Chinese control, with Mainland China accounting for eight and Taiwan accounting for one; Vietnamese troops have seized the greatest number of islands, 29. Eight islands are controlled by the Philippines, five by Malaysia, and two by Brunei. The Indian Ambassador to Vietnam, while expressing concern over rising tension in the area, said that 50 per cent of its trade passes through the area and called for peaceful resolution of the disputes in accordance with international law. On July 20, 2011, the PRC, Brunei, Malaysia, the Philippines, the ROC and Vietnam agreed to a set of preliminary guidelines which would help resolve the dispute. The agreement was described by the PRC’s assistant foreign minister, Liu Zhenmin, as “an important milestone document for cooperation among China and ASEAN countries.” Some of the early drafts acknowledged aspects such as “marine environmental protection, scientific research, safety of navigation and communication, search and rescue and combating transnational crime,” although the issue of oil and natural gas drilling remains unresolved. to rely on the tried and trusted way of making settlement – cash. learned about driving from Bruce McLaren. “Some bankruptcies, shrinking, consolidation, very limited new orders, cancellation of large parts of the order book and cyclically elevated scrapping,” he added. I hope I’m not the only person listening. By Jeane Manning LOST HISTORY The Georgia Guidestone Mystery By Robert M.
then we can get that bit closer to San Diego.